For Greek visual artist Maria Mavropoulou, photography is a malleable medium that she edits and shapes to fulfil her artistic intentions. Born in 1989, she initially studied painting and sculpture at the Athens School of Fine Arts before turning to photography and digital media. She has participated in numerous exhibitions in Greece and abroad, including the fifth Athens Biennale and more recently the 30 Under 30 Women Photographers in Lille, France. Mavropoulou is also a member of the Depression Era collective, a group of artists that became active in the aftermath of the 2008 economic meltdown. In her work, Mavropoulou takes different approaches to the photographic image to create specific moods and visual impressions. In Geometry of Chaos, she uses images of plain pewter nails to create repetitive patterns that play with the viewer's perception and the concept of repetition. In The Desire for Consciousness, a series of abstract images create a freeform vocabulary of ideas and meanings that is up to the viewer to decide what they stand for. And in the widely published Inner State series, Mavropoulou takes images from typically Greek settings and taints them with an ominous fog, as a reference to the psychological implications of a now decade-long financial depression. 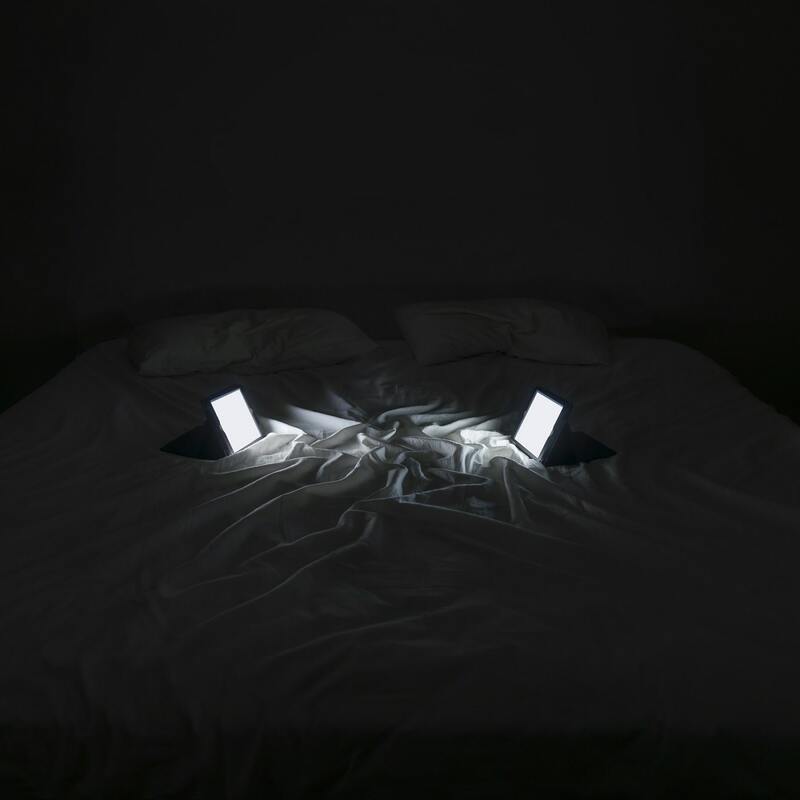 In 2018 Mavropoulou completed a master's degree at ASFA with a multimedia project presented in the form of an interactive installation that deals with our relationship with digital devices and the internet. Out of this research a new body of work is emerging called Family Portraits, where she photographs illuminated device screens in private settings but without their users. We had the opportunity to ask the artist a few questions about this body of work in progress, and her ideas behind it. Maria Mavropoulou. The Lovers, Family Portraits series, 2018-ongoing. Courtesy of the artist. Intimacy plays a big part in Family Portraits. Do you see devices as replacements of human intimacy, or do your images function in a symbolic way? We generally think of the devices as objects, we don’t really consider that they are something more than just tools of communication, facilitating our everyday life. But how do we feel when we forget our mobile at home? Or even worst, somewhere out there? What a violation of our privacy do we feel when someone else is checking out our devices? We actually have a very strong bond with those devices either we realize it or not, even though they are easily replaceable as objects. They know our routine, our habits and our secrets. They guide us through the real world, answer our questions, advice us and keep us company day and night. We look at them, touch them and talk to them in such an intimate way. In my point of view they are a kind of a stand-in, not really replacing humans, but filling the space between us. As human beings we have evolved for face-to -face communication. That is why body language and voice tone play such an important role in it. It’s funny how emojis try to substitute that and how our human-to-human communication has changed in order to be “device friendly”. Symbolic or realistic, but with a subtle humor, my images question these relations between human and device. 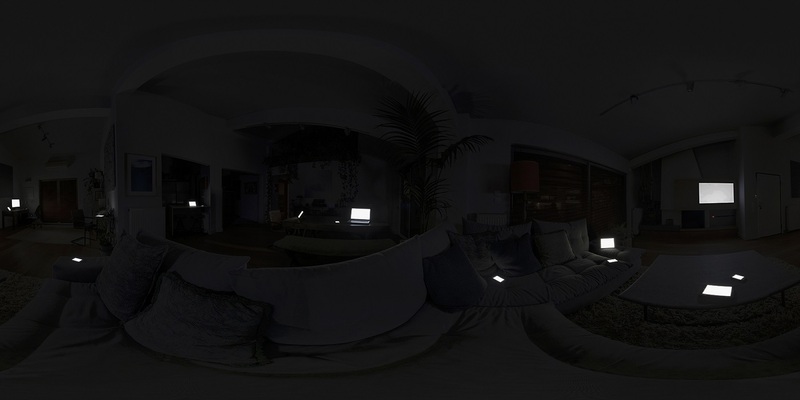 A component of the Family Portraits project is a virtual tour inside a dark home full of screens. What is the idea behind this environment and how did you make it? I am frequently experiencing myself in places like the one I created. People finding themselves in the same physical space who are actually worlds apart while looking at their screens. The main idea was to create a house interior -- a common experience for most of us -- but make the visitor feel as an intruder in somebody else’s house. By taking away the feeling of familiarity, one perceives the rather usual scenery [of the work] as extraordinary, letting him evaluate the situation he is into with a fresh perspective. To create this virtual tour I found the interior that suited my purpose and placed around it the devices of the house's inhabitants. Then I photographed the scene in a certain technique, stitched the photos together and used the appropriate software to get the final result. Maria Mavropoulou, screenshot panorama from VR installation, Family Portraits series, 2018-ongoing. Courtesy of the artist. At your exhibition at ASFA, the room walls were covered with infographics about the use of the internet and data today. What are your conclusions about our use of the internet and digital devices? Are they changing our lives? A big part of my research was based on statistics about the use of internet and connectible devices. The immensity of this parallel universe, the internet, is nearly impossible to visualize in other way than through numbers. So all those infographics were the only way to find measurable aspects of what I am trying to convey. It is totally profound that, from the moment that mobile devices gained access to the internet, our life has changed in innumerable ways. But what really blows your mind is the scale of it. The volume of data that is created daily increases in geometric progression: every click, every tap on the screen creates data! But what I personally found the most interesting and the most troubling (or alarming) is how predictable we humans are. As users of the internet we are part of those statistics, we are the numbers they are referring to. We act in patterns, and the more information we give about ourselves -even if it’s the most insignificant – the more foreseeable we become. With each click we are letting the filter bubble that we are in become narrower and narrower. Are you for or against this? And is that opinion part of your work somehow? I don’t feel that there is any need to choose either side. History has shown that whatever man has created, bad or good, he then had to live with it. Technological evolution never made steps backwards. The question now is how we use these new technologies. Are we aware of their impact on us? Are we well informed about them? For me these are the most important issues that we have to deal with. With my work I try to raise questions. There are no easy answers. Raising awareness motivates further research and that’s the only direction I wish to point to. This project is a great example of how your practice extends beyond photography. What is photography for you and how does it relate to your interest in other media? Photography is the way I am used to think. I enjoy the inherent openness to interpretations of the medium itself. But photography has changed the past decades a lot, it has evolved from a finite piece of paper to new states of existence that is still difficult to understand or describe completely. An important change that I spot is that photography’s “weight” has shifted from the past to the present; by that I mean that photographs today are less the memory objects that they used to be and they serve more and more as proof of the moment they are referring to. They are actually so bound to that moment that they lose all their importance after that moment has passed. It is that notion of “newness” that gives them meaning. In my practice I use photography as a starting point and then alter the images to fit my intentions. During my studies at the Athens School of Fine Arts I was introduced to different artistic practices and had the chance to experiment with other mediums. So although I mainly use photography, I always try to merge in it this experience. In my last series, Family Portraits, I went a step further by using still photography to create a navigable environment that the viewer can explore at his own will. Inside this virtual installation, photography is the building block of an experience. Being surrounded by a photograph that looks nearly as real as reality poses even more questions about what photography is and where that leads us.